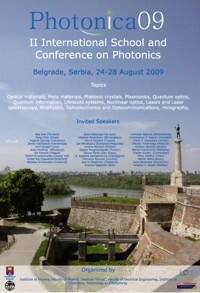 You are invited to attend the PHOTONICA09 (August 24-28 2009), International School and Conference on Photonics. PHOTONICA09 will include five days of short courses, invited lectures and posters. The conference seeks to promote the dissemination of knowledge in various disciplines of optics. We hope that students and young scientists will especially benefit from the program, which provides both tutorials and most recent results in many topics to be covered by the meeting. The Conference will take place in the "Kolarac" building, in downtown Belgrade. For you accommodation, you can choose among several hotels within a walking distance from the venue of the Conference. We look forward to see you in Belgrade in August 2009. August 23, from 3-9 pm. August 24 - 28, from 8 -12 am.